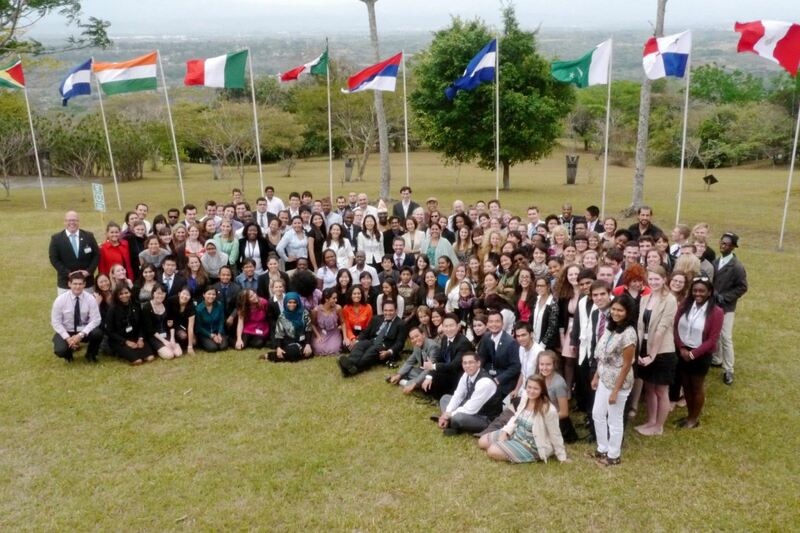 Participants at the 2013 United Nations University for Peace Model UN Conference in Costa Rica. Photo by UPMUNC media, used with permission. The preamble of the United Nations Charter states that its purpose is “to save succeeding generations from the scourge of war” and enable the peoples of the world “to practice tolerance and live together in peace with one another as good neighbours.” At Pace University in New York City, surrounded by the vast diversity of our urban campus, we aim to teach young global citizens the knowledge, capacities and skills needed to promote peace. 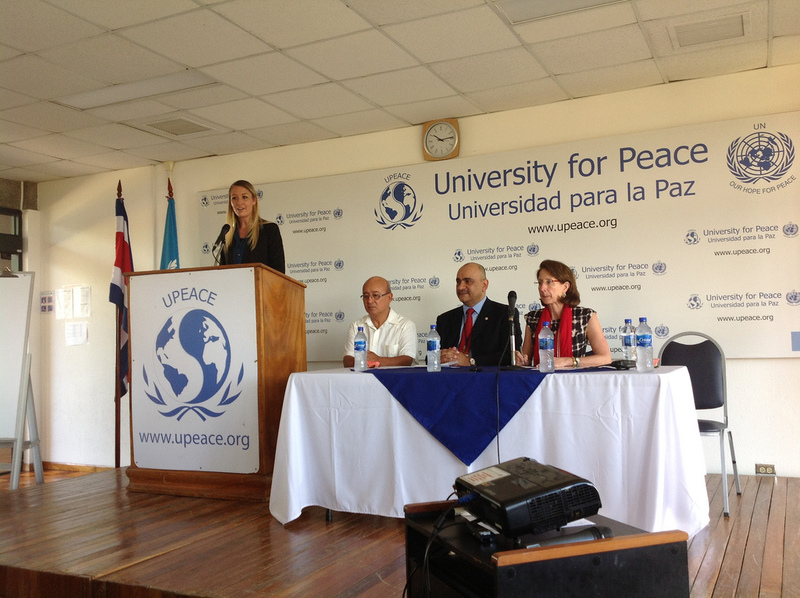 Last month, 13 students and two faculty from Pace traveled to Costa Rica to attend the 2013 UN University for Peace Model UN Conference. Joined by a a mix of 150 college, graduate school and high school students from 49 countries at the most diverse ever UPeace conference, they discussed in depth “The Path to Peace in an Increasingly Connected Global Society.” Their effort and engagement was recognized by the conference organizers with four awards for diplomatic ability and representation of civil society perspectives. 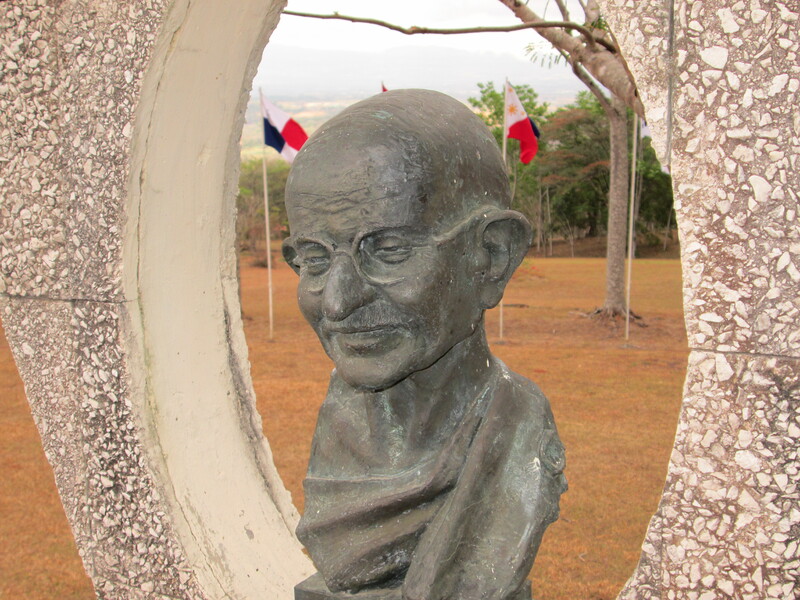 A statue of Mahatma Gandhi at the UN University for Peace in Costa Rica, where 13 students and two faculty from Pace University participated in a Model UN conference focused on peace issues in March. In addition to the focus on peace and social justice issues, the organizers of the UPeace conference tried to run the committees in ways that modelled broad-based and collaborative global policymaking. For example, most Model United Nations conferences effectively have a “time-freeze” the day of the conference and only deal with what has happened in the past. By contrast, the UPeace conference had an ongoing “real-time crisis” dimension, a dynamic simulation of conflict in the Korean penninsula. This made a particular difference in the conference’s simulation of the UN Security Council, which had to respond to the developing situation while overcoming significant political gridlock. 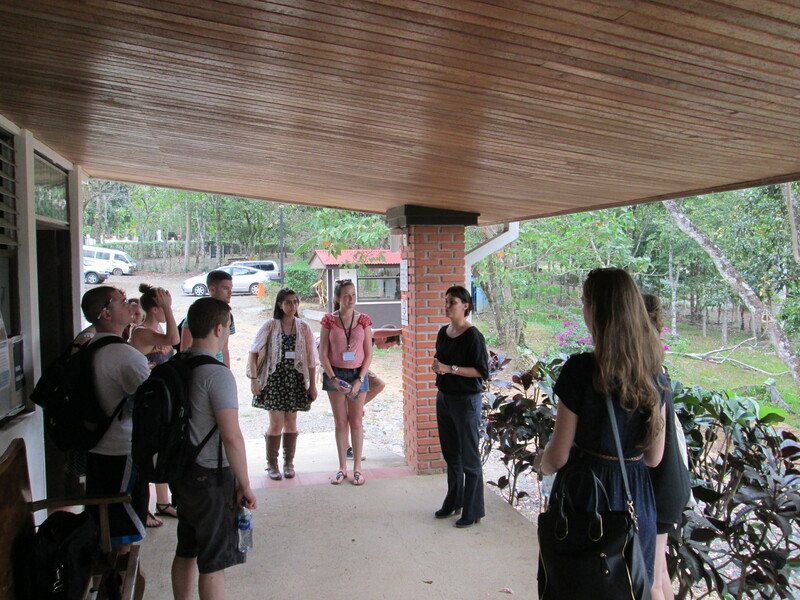 Pace University students take a tour of the UN University of Peace in Costa Rica before their participation in a Model UN conference in March. Four other Pace students participated in the Security Council simulation: Michael Zona ’13, a head delegate who won a “Most Diplomatic” award for his representation of Russia; Kelsey McGhee ’14, Australia; Brandon Snively ’14, Argentina; and Nathaniel French ’15 (Azerbaijan). To read more about Pace University students’ participation in the UPeace Security Council simulation, click here. Adding to the complexity of the conference, students dealt not only with fellow delegates representing UN Member States, but also those playing the role of media professionals and civil society advocates. Pace head delegate Kimberly Alonso ’13 was part of a team who provided regular “news” updates to the committees, grilled other students on their countries’ policies and filed stories by strict deadlines. Similary, Michelle Gallo ’13, representing Amnesty International, pushed participants to maintian high standards in the resolutions they adopted. Opening Ceremony of the 2013 United Nations University for Peace Model UN conference in Costa Rica, attended by 13 Pace University New York City students in March. Photo by UPMUNC media, used with permission. To read more about Pace University students’ representation of media and civil society at the UPeace conference, click here. To read Kimberly Alonso’s in-depth reflections on her experience at the conference, click here. Michelle was specifically assigned to the conference’s simulation of the Human Rights Council, along with head delegate Elena Marmo ’15, who was recognized with a “Most Diplomatic” award for her representation of Belgium; Cassandra Stimpson ’13, voted Best Overall Delegate in the committee for representing Uganda; and John Ciccarelli ’15, Switzerland. To read more about Pace University student’s participation in these discussions of contemporary challenges to human rights, click here. For Elena’s in-depth reflections on the committee, click here. Pace students had an advantage in the Human Rights Council simulation. Prior to the conference the 13 Pace students received a three day certificate course on “Contemporary Challenges to Development and Human Rights” taught by UPeace faculty. 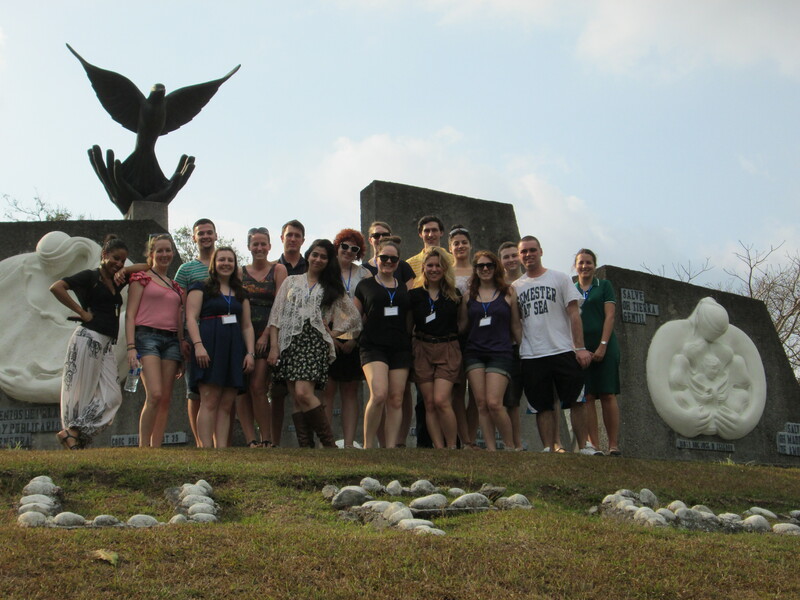 Pace University New York City Model United Nations students at the Monument for Disarmament, Work and Peace on the UN University for Peace’s campus in Costa Rica. Led by Mihir Kanade, Director of the UPeace Human Rights Center, the course gave students an intensive look at the role of international financial insititutions, legal norms on forced migration and humanitarianism in conflict. It included a field visit to La Carpio, a settlement of Nicaraguan migrants in San Jose, where students interacted with the community and met staff and volunteers of the Costa Rican Humanitarian Foundation. For Elena’s reflections on the human rights training, click here. She also wrote about what she learned from the visit to La Carpio, to read her blog on it, click here. The UPeace conference also made an especial effort to ensure participants were aware of cultural, linguistic, national diversity. Students were encouraged to be inclusive and sensitive to difference. The UPeace conference opened with an address from US Ambassador to Costa Rica, Anne Slaughter Andrew, who told participants that she looked forward to the day that diplomats like her would not be introduced as the “first woman ambassador to Costa Rica.” The Model UN simulation, she said, offered an “great opportunity” to gain experience in “how challenging it is to cross cultures” and the skills for international service. This was particularly true in the simulation of the UN Entity for Gender Equality and the Empowerment of Women (UN Women), in which students were challenged to take seriously the gender dimensions of international politics. Katie James ’14, Pace University New York City Model United Nations head delegate, discusses her countries’ positions to a ‘journalist’ in a simulation of UN Women at the 2013 UN University for Peace Model UN conference in Costa Rica. Photo by UPMUNC Media, used with permission. Also in the UN Women committee were Amanda Orcutt ’13, representing Djibouti and Fatima Mustafa ’15, Saudi Arabia. To learn more about their discussions on the protection of the rights of women and other civilians in conflict, click here. The United Nations University for Peace is a UN-mandated university founded in 1980 to “provide humanity with an international institution of higher education for peace.” Its location just outside San Jose, the capital of Costa Rica has symbolic meaning. Costa Rica has been a global leader in peace and social justice issues since it abolished the death penalty in 1882 and its army in 1942. Located only two express subway stops from the iconic United Nations complex on the East River, Pace University’s New York City Model UN program has a 60-year history of excellence in regional, national and international conferences. Model UN at Pace is uniquely integrated into the political science curriculum within the Dyson College of Arts and Sciences and aims to encourage students to develop wisdom, knowledge, skills and community for global citizenship and vocation. This entry was posted in News and tagged Brandon Snively, Cassandra Stimpson, Elena Marmo, human rights, Jean Dorak, John Ciccarelli, Kimberly Alonso, La Carpio, Matthew Bolton, Michael Zona, Michelle Gallo, Model UN, Model United Nations, Monument for Disarmament Work and Peace, MUN, Nathaniel French, New York, Pace University, University for Peace, UPEACE, UPMUNC. Bookmark the permalink.